The Western Museum Of Flight's Douglas A-4A "Skyhawk", was assigned to the USMC. We received a note from a former Marine Aviator telling us he flew this particular aircraft, BuNo. 142227, while stationed in Japan. 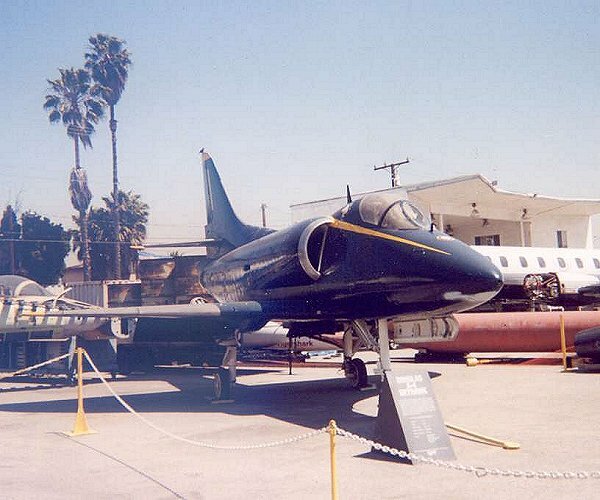 It is also our understanding that this Skyhawk may have been assigned to a training unit at NAS Alameda. 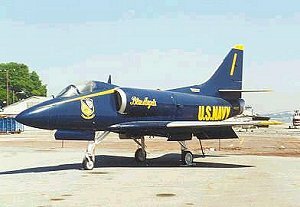 When we acquired the A-4, it had NAVY / MARINES painted on both sides of the aft section of the fuselage and was in need of a paint job when it arrived at the museum. 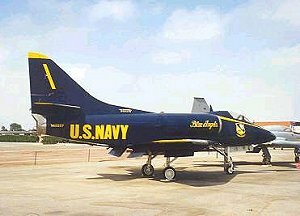 In 1995, the aircraft was repainted in the proud colors and markings of the U.S. Navy's famous Blue Angels demonstration team. The new paint job was completed via the combined efforts of the Western Museum of Flight restoration committee and the production crew of the Tantalizing Takeoffs(tm) Calendar series. The actual preparation and painting was completed by a dedicated crew led by Tantalizing Takeoff's Calendar Associate Producer, Ed Ashley.